Though your teeth may face many issues, one of the worst is also one of the most common: tooth decay. Tooth decay is actually an infection that can destroy your tooth and can even reach your gums if not treated by a dentist (your teeth are incapable of healing on their own, so the infection will continue until it is treated). If you do develop a cavity, and begin to experience symptoms such as toothaches or sensitivity, schedule an appointment with us immediately. We can fill your tooth, or, in more extreme cases, perform root canal therapy. 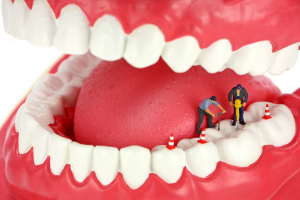 Your teeth develop decay when plaque, tartar, and bacteria build up on them. You can clean these microbes off of your teeth by brushing and flossing them every day. However, if the plaque is allowed to remain on your teeth, it can create acid that wears a hole in your enamel. The bacteria will then attack the rest of your tooth once it slips past the damaged enamel. If this bacteria are allowed to progress, the infection can reach the pulp (inner layer) of your tooth, which houses blood vessels and nerves. Once this has happened, you will need a root canal treatment. Root canal therapy is similar to filling a cavity, but the procedure delves deeper into your infected tooth. We will first numb the area around the tooth, remove the infected material, and then sanitize the tooth’s root canal (which is connected to the pulp). Using a material called gutta-percha, we will fill the root canal to protect your oral health from the potential spread of infection. If you hesitate to receive root canal treatment, then the decay can spread until the only option is to remove your tooth. Root canal therapy allows us to save your tooth to prevent the need for extraction, and the possible side effects of losing the tooth.